Words to live by. He, like the character in one of his signature songs, was a puppet, a pauper, a pirate, a poet, a pawn, and a king; and above all, he was the quintessential showman. I was fortunate to have had two of my bucket list items crossed off my list: first when I saw Frank Sinatra in concert back in the 70s at the Westchester Premiere Theatre (no longer in business); and then Frank Sinatra, Jr. in concert just a few years before he passed away. 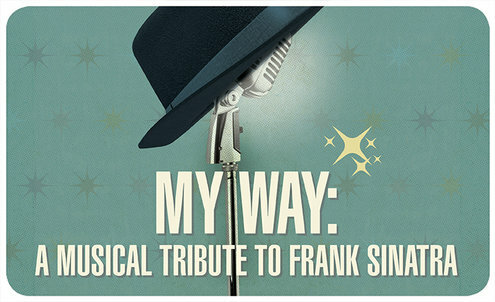 So naturally I was bouncing off the walls when I heard that Ivoryton Playhouse was going to present My Way: A Musical Tribute to Frank Sinatra. I am happy to report that the production is everything I expected and more! And the show finally answered a question that has plagued me for the past forty years – ever since I had seen Sinatra live. Why was the Chairman of the Board wearing a pink leisure suit? Yes, it was the 70s and leisure suits were in fashion – but still! Where was Frank’s signature concert wardrobe – black tie and tux? My Way answered it for me – Frank Sinatra purportedly had said that if you had the option of wearing a black tie – do it – unless it was a Sunday. I had seen Frank Sinatra on a Sunday way back when. Mystery solved. That and other information about Sinatra was carefully peppered in between medleys of his songs. 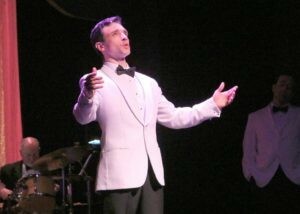 Indeed, it was not just a juke box musical thrown together with a caricature and/or look-and-sound-alike of Sinatra. It was a real show that offered a real look at the man and his music. 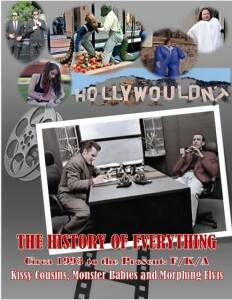 It was created by David Grapes and Todd Olson, with book by Olson and original direction by Grapes. Ivoryton’s production was skillfully directed and choreographed by husband-and-wife team Joyce Chittick and Rick Faugno. Mr. Faugno also was one of the incredibly talented performers along with Lauren Gire, Josh Powell, and Vanessa Sonon. Each of the four triple-threats made every medley a show-stopping number with both singing and choreography. The tap dancing numbers alone were amazing. The thing that I loved about the show was that it was a REAL tribute to the man and his music. Rather than using singers who sounded or looked like Sinatra, the ghost of Sinatra (who I am sure was smiling in the wings) was conjured through the entire gestalt of the show: the singing, the dancing, the lighting, the period dress, the side bar, the drinks. I also enjoyed that there were Sinatra’s well known standards like “My Funny Valentine,” “High Hopes,” “I Get a Kick Out of You,” “My Kind of Town,” “All the Way,” “It Was a Very Good Year,” “That’s Life,” and many others. But there were lesser ones too; ones that I am ashamed to admit as an ardent Sinatra fan that I had never heard before. As noted, the cast was superb. Rick Faugno (who also co-directed the show) was awesome, singing and dancing (especially tap dancing) with incredible energy and verve. Josh Powell not only brought his formidable singing talents, but also great comedic flare and timing to his performance. 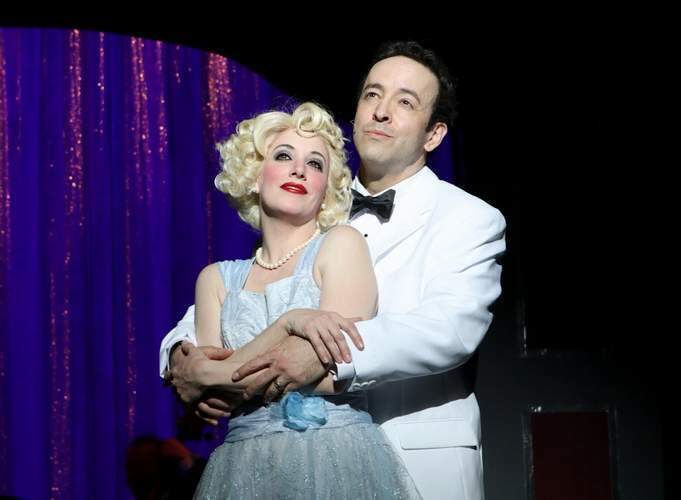 The female view of Sinatra was amply represented by both Vanessa Sonon and Lauren Gire. Their renditions of his songs reached goosebump range. If truth be told, I was in torment throughout the show. I was having so much fun, I didn’t want it to end. Yet, I couldn’t wait for their take on my favorite song of all time – “My Way” (written by the great Paul Anka for Sinatra) which I knew had to be at the end of the show. When it came, it brought tears to my eyes – tears of happiness because their rendition was incredible; tears of sadness because the show was over. While some say imitation is the best form of flattery, it often can fall flat, especially when the imitator can’t even come close to the real thing. On the other hand, a top-notch, standing ovation-worthy homage may indeed be a better, higher form of adulation. 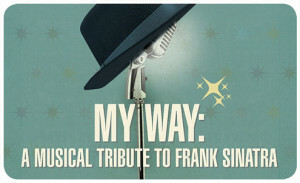 And that’s precisely what you’ll get at Ivoryton Playhouse’s My Way: A Musical Tribute to Frank Sinatra, a dynamic piece of musical theatre created by David Grapes and Todd Olson (who also wrote the book). Chock-full of tidbits about Sinatra’s life and style, it also is total immersion into the crooner’s extensive musical history, woven together like a stunning tapestry. 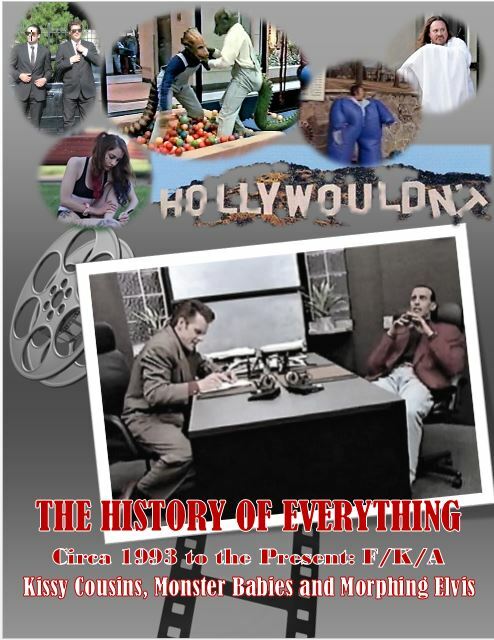 With original direction by Grapes, Ivoryton’s production of My Way is directed and choreographed by husband-and-wife-team Joyce Chittick and Rick Faugno (Pillow Talking loves that!) and features a ginormously gifted four-member cast: Rick Faugno, Lauren Gire, Josh Powell, and Vanessa Sonon. 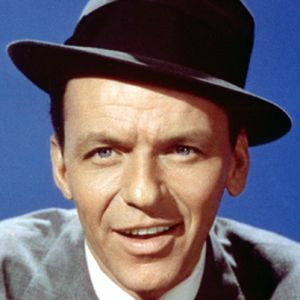 It not only honors the singing, acting icon known to many as “Ol’ Blue Eyes” as they all really do sing good songs — some 60 or so of the 1,300 he recorded – but it’s also a picture-perfect blast back to the weak-in-the-knees Swoonatra era. Set in a nicely appointed nightclub/lounge and evoking the look and feel of Sinatra’s swanky heyday (complete with black tie attire and plenty of imbibing) the quartet passionately bounce through the soulful legend’s songbook. With outstanding renditions of everything from “The Way You Look Tonight,” “My Funny Valentine,” “Summer Wind,” “You Make Me Feel So Young,” to “The Lady Is a Tramp,” “Witchcraft,” “My Way,” and “New York, New York,” you just can’t get enough and likely won’t want the show to end. And if the audience’s chair-dancing is any indication, the performers more than hit each and every one of their marks. Faugno is a triple-threat who can belt it out, tap dance like there’s no tomorrow, and act a blue streak. He’s commanding, charming, and an altogether incredible showman (its no surprise he was the original Frankie Valli in the Las Vegas production of Jersey Boys). And while he’s not overtly playing the “Chairman of the Board” himself, he brings Sinatra to the stage as if channeling him like some kind of spirit guide. The lovely and talented Gire’s pipes are utterly flawless, creating that magically thrilling phenomenon known as musical frisson – you know, that dopamine joyride that sends chills through your body when you hear a voice so incredible, it doesn’t seem real? I was constantly thinking of Judy Garland’s rich and uniquely beautiful instrument with her every note. Theatre and opera veteran Powell is not only a fantastic performer, but he rakes in many of the laughs; he’s endearing and at times charmingly hapless, and a wonderful crooner to boot. Sonon, who has numerous Broadway and regional theatre credits to her name, also steals more of the comic moments of the two ladies in her quirky and delightfully effervescent delivery. Her energy is downright infectious. Whether solo, duet, or all four together, the quartet commands the stage and masters the music and dance. And backed by an incredible orchestra, major shout outs also must go to Andy Hudson as musical director, Matt McCauley on bass, and Gary Ribchinsky on drums. Kudos to scenic designer William Russell Stark, costume designer Elizabeth Cipollina, lighting designer Christopher Hoyt, production stage manager Laura Lynne Knowles, associate director/choreographer Holly Cruz, and sound designer Tate R. Burmeister. You don’t have to be a Sinatra devotee to enjoy My Way. With the majority of the songs recognizable to most, is pure escapist entertainment: enchanting to the ears, wondrous to the eyes, and with the incredible talents taking to Ivoryton’s stage, it will even amaze and amuse your soul.